Det er onsdag og Dream Team-tid. Dagens kort er et enkelt bursdagskort med shakerboks i flukt med fronten. It’s Wednesday and Dream Team time. Today’s card is a simple birthday card with a shaker box flush with the front of the card. Jeg har maskert sammen Giggling Snowman sammen med feene fra Fairy Christmas, skjært ut innmaten til den største snøballen og gjort den om til shakerboks. 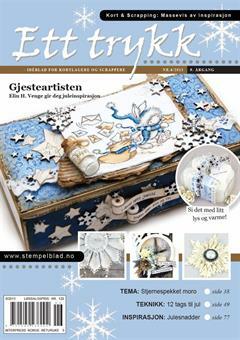 Jeg stemplet ordet Gratulerer fra Grattis-platen til Norsk Stempelblad AS og lagt distressglitter i selve shakerfeltet. I masked Giggling Snowman with the fairies from Fairy Christmas, cut out the largest snowball and turned it into a shaker box. I stamped a sentiment from a Norsk Stempelblad AS stamp set inside the shaker and put distress glitter inside. Kortet er ganske stort, det måler 7 x 4 1/4″ og motivet dekker hele fronten. Vingene er dekket med et strøk Wink of Stella, men det vises ikke på bildet. Kortbasen er laget av Aqua Mist kartong fra Papertrey Ink, som matcher den turkise fargen jeg har brukt på motivet. The card is pretty large, it measures 7 x 4 1/4″ with the merged image covering the entire front. I added a coat of Wink of Stella on the fairy wings, but it doesn’t show in the photo. I made the cardbase from Papertrey Ink Aqua Mist cardstock, which matches the color I used on the image. As usual I finish with the colors I’ve used on my image.